VCB full form is Vacuum circuit breaker. VCB or vacuum circuit breaker is defined as the circuit breaker in which vacuum is used as the arc quenching medium. Since vacuum offers highest insulating strength, it has far superior arc quenching properties than any other medium. When the contacts of the breaker are opened in vacuum, the interruption occurs at first current zero with dielectric strength between the contacts building up at a rate thousands of times higher than that obtained with other circuit breakers. 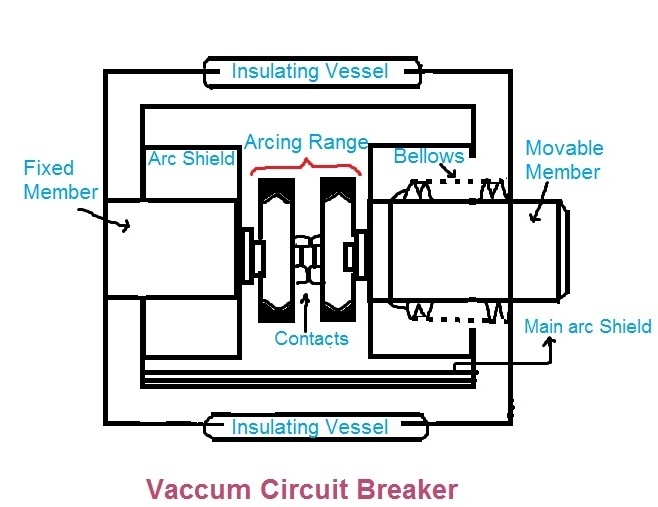 Production of arc in a vacuum circuit breaker and its extinction can be explained as follows: When the contacts of the breaker are opened in vacuum, an arc is produced between the contacts between the contacts by the ionization of metal vapors of contacts. However the arc is quickly extinguished because the metallic vapors, electrons and ions produced during arc rapidly condense on the surfaces of the circuit breaker contacts, resulting in quick recovery of dielectric strength. As soon as the arc is produced in vacuum, it is quickly extinguished due to the fast rate of recovery of dielectric strength in vacuum. It consists of fixed contacts, moving contact and arc shield mounted inside a vacuum chamber. The movable member is connected to the control mechanism by stainless steel bellows. This enables the permanent sealing of the vacuum chamber so as to eliminate the possibility of leak. A glass vessel or ceramic vessel is used as the outer insulating body. The arc shield prevents the deterioration of the internal dielectric strength by preventing metallic vapors falling on the inside surface of the outer insulating cover. 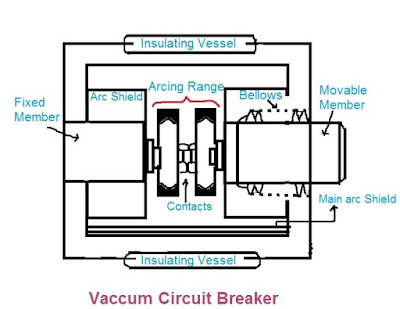 VCB breaker parts are shown in the figure below. When the circuit breaker operates, the moving contact separates from the fixed contact and an arc is struck between the contacts. The production of arc is due to the ionization of metal ions and depends very much upon the material of contacts. The arc is quickly extinguished because the metal surfaces of the moving and fixed members and shields. Since vacuum has very fast rate of recovery of dielectric strength, the arc extinction in a vacuum breaker occurs with a short contact separation. They have low inertia and hence require smaller power for control mechanism. they can successfully withstand lightening surges. They require little maintenance and are quite in operation. It can break any heavy fault current perfectly just before the contacts reach the definite open position. vacuum circuit breaker is employed for outdoor applications ranging from 22 kv to 66 kv. Even with limited rating of 60 to 100MVA. VCB breaker is suitable for a majority of applications in rural areas.